Anyone who’s played around with Storyline variables knows how powerful they are. One of the variable types available to you is the number variable. You can use number variables to calculate all kinds of mathematical equations, from a simple addition and subtraction, to complex multiplications and divisions. Why are number variables useful in e-learning? One reason is that they’re a great way to calculate points for a score across multiple slides. 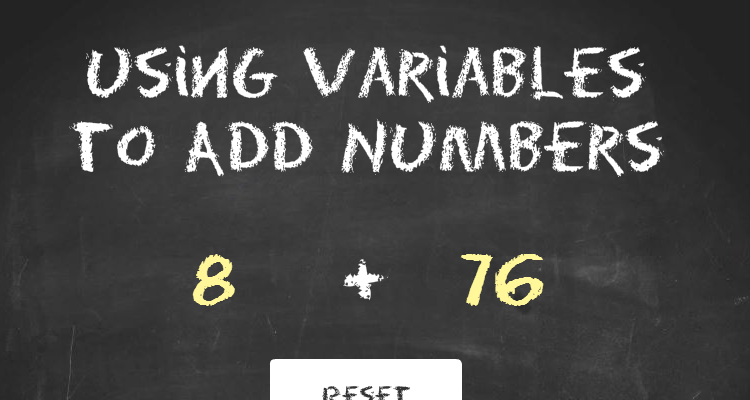 You can also use number variables to simulate a real-life calculation learners need to do on the job. The first thing you want to do is create your slide, which will have 2 layers. First, create a base layer and drop in 2 text entry fields. In my example, I styled the text entry fields to be transparent and have the chalkboard-style font. You also want to add a button on this base layer. This button is what triggers the equation to happen. The next thing you’ll want to do is create a slide layer. This slide layer reveals the total of the calculation and a button which resets the equation. Make sure you check off the slider layer option that prevents the user from clicking on the base layer. For this interaction you will create 3 number variables. In my example, I named the variables Add1, Add2, and AddTotal. You will assign the Add1 variable to the first text entry field, the Add2 variable to the second text entry field, and on the slide layer, create a reference that displays the AddTotal variable. The last thing you need to do is create the triggers that control the behaviour of the interaction. On the base layer, add 3 triggers to the “View Total” button. The first trigger adds the value of the Add1 variable to the AddTotal variable, a second trigger adds the value of the Add2 variable to the AddTotal variable, and a third trigger shows the slide layer. On the slider layer, you also need to add triggers to your “Reset” button. You want to add 4 triggers in total. 3 triggers that reset each of the 3 variables to 0, and one that hides the slide layer, to bring you back to the base layer where you can continue adding different numbers over and over again, as long as you please! Ta-da! That’s how easy it is to build this simple addition using Storyline’s number variables. Do you have any comments or questions? Leave them below! Don’t forget to follow us on Twitter for all the latest news related to Articulate software and e-learning! Great article, Nicole - first thing to read by the variable beginners :) And I like this font style matching the blackboard design. Thanks, Joanna! I appreciate the comment :) The font is called Eraser and is available for free for download online. I am trying to visualize how I can use number variables to keep a running score and then use the score in a calculation at the end. I am working on a storyboard where the palyer will be moving around a maze with opportunities to answer questions and then add or loose points (money). So is there a way to have the result of the quiz add or subtract to a running score? I don't have Storyline 2 yet (I have worked with Storyline so I understand the concepts of trigers, stages, and layers) I am working up the story board and graphics and then will download the free trail to create a demo. I want to show a group that I work with how Storyline can open a different (more modern and relevant) door for communication, training and info sharing. Hi Katie! Thanks for your comment! Yes, you can absolutely do that. Ive just added it to my article/tutorial to-do list to create an example that shows a running score across multiple slides, and then ill show you can reuse or display that score at the end. It's totally possible with Storyline! Thanks again for your comment... stay tuned for more! Nicole any idea when we can expect to do a bit more than just add, subtract, multiply and divide? When will square root, log and trigonometric functions be available for the science community using Storyline 2? I agree with Alphonso. But also when you want do "simple" stuff like adding multiple variables (e.g. 10 or more), multiple if statements or want to use random numbers you almost always have to use java programming which makes Storyline less flexible for multiple platforms. A mathematical toolbox in storyline would be great. Not only for science, but also for gaming and flexible graphics. Great suggestion, Alphonso! That would make a great feature request: http://www.articulate.com/support/contact/submit.php?form=feature Marcel - I suggest you also submit a feature requets for it. The more people who want a feature, the more seriously our developers consider implementing it! Hi Nicole I already made this feature request back in the STORYLINE 1 days. Do I have to repeat my request now that we in the SL 2 phase? @ Marcel I have managed to do square root calculations using first approximations and a series of additions, divisions, multiplications and subtractions after that - if anyone is interested, I will post SL2 file. Problem is, it was a nightmare to code in SL2 and would put any prospective science/maths teacher off the product, whereas we want to attract them to it. Good point, Alphonso! That would be so nice if you can share that file and maybe help save others from all that time and effort! @alphonso. You could also use a JAVA script like (Input and Result are variables you define inside Storyline): var player = GetPlayer(); var x = player.GetVar("Input"); y = Math.sqrt(x); player.SetVar("Result",y); Saves you a lot of troubles. @ Nicole. Will do. have also followed your suggestion and resubmitted a feature request. Cant wait for SL3. @alphonso. It seems you wrote this in SL2. I am currently still waiting for my upgrade to Storyline 2. The IT department is a little bit slow...so I can't have a look at your file. If you have troubles implementing the Java, just let me know. BTW Java only works in IE, so if you want to use Chrome use the HTML5 output while publishing. Wow is right - Marcel! Thank you for being such a generous and helpful community member. Alphonso, you are correct -- we get so many feature requests its impossible to implement EVERYTHING, so we try to go by what people want and need the most, and the way we know this is by discussions happening in the community and of course through feature requests. So the more people who submit the requests, the better the odds! Great discussion. I can imagine advanced math being an interesting feature.